Following initiation by an appropriate signal, the actin cytoskeleton is reorganized to facilitate invadopodia formation. 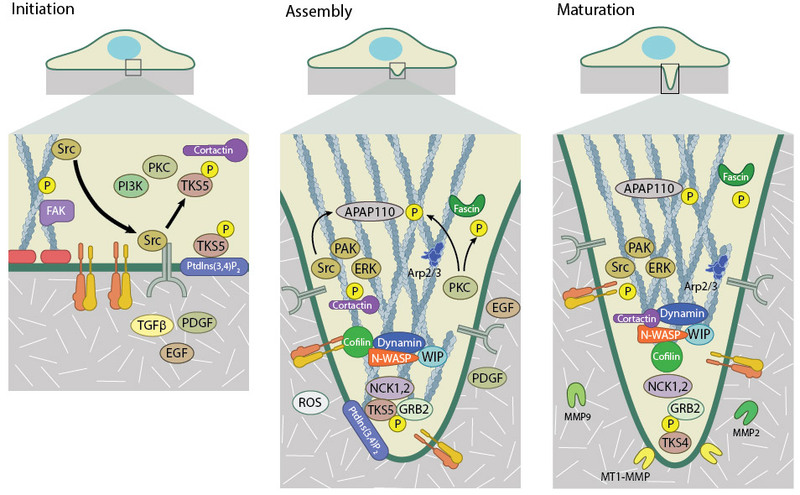 Although several kinases and GTPases are known to influence the transduction of extracellular signaling events leading to F-actin nucleation, there is currently no clear consensus on the precise steps involved . The phosphorylation of cortactin is known to occur prior to F-actin nucleation , after which arrays of actin filaments begin to assemble. Invadopodia formation takes places in three stages – Initiation, Assembly, and Maturation. Initiation is driven by the release of SRC kinase from the focal adhesion. SRC binds and activates TKS5 and other kinases such as PKC and PI3K. Activated TKS5 associates with cortactin to promote actin filament polymerization. During assembly, the actin cytoskeleton undergoes reorganization into an invasive structure. This is catalysed via the recruitment of actin polymerization machinery including the Arp2/3 complex, WASP, and fascin, along with kinase activity. Once matured, invadopodia can degrade the extracellular matrix by membrane-bound (MT1-MMP) and secreted matrix metalloproteinases (MMP2 and 9). Two distinct types of filamentous actin networks are suggested to cooperatively form invadopodia – a branched actin network that forms the base of the structure and a parallel array of bundled actin filaments that form along the length of the invadopodial shaft. The latter is responsible for its elongation  and works together with microtubules and intermediate filaments to extend the invadopodia . The production of these two actin networks are driven by different molecular components. Formation of the branched array of actin filaments at the base of invadopodia is driven by Arp2/3 and its activator N-WASP . The activation of N-WASP is facilitated by the Rho GTPase Cdc42, WIP (WASP interacting protein) and Nck1 (non-catalytic region of tyrosine kinase adaptor protein 1) – all of which have been found to localize to invadopodia and are necessary for their formation . The resulting structure resembles the actin core of podosomes. Elongation of invadopodia is suggested to be driven by the extension of parallel arrays of bundled actin filaments that are present along the length of invadopodia . Extension of these filaments is driven by formins (Functional Module: Formin-nucleated Actin Cable Assembly), whilst their bundling is coordinated by the actin cross-linker fascin. Studies have shown both formins  and fascin  localize to invadopodia and are necessary for their formation and stability. Additional proteins required for maintaining the stability of these structures include members of the Ena/VASP family. The invasive isoform of the Ena/VASP protein MenaINV has been shown to stabilize invadopodia and is hypothesized to do so either via stimulating actin polymerization from free barbed ends or through the bundling of actin filaments . Invadopodia extension is driven by actin polymerization and hence the concentration of G-actin-ATP monomers at the invadopodia tip contributes to the rate of extension. The actin severing protein cofilin has been shown to generate free barbed ends onto which G-actin monomers can be added . The activity of cofilin is focused within the core of the invadopodium by the action of the RhoGTPase RhoC . RhoC activity is regulated by its activator, the guanine nucleotide exchange factor (GEF) p190RhoGEF and its deactivator, the GTPase activating protein (GAP) p190RhoGAP. The phosphorylation of cofilin by RhoC decreases its severing ability, therefore in order to promote extension of the invadopodium, RhoC activity is limited to regions beyond the invadopodium core. This is achieved by restricting the localization of the RhoC activator p190RhoGEF to regions surrounding invadopodia, whilst the RhoC deactivator p190RhoGAP localizes within invadopodia . The spatially regulated activity of RhoC, and subsequently cofilin, leads to barbed end production within invadopodia, which facilitates actin polymerization and filament extension. The rate of extension is also dependent upon the ability of the growing filaments to overcome membrane resistance and the concomitant incorporation of new membrane. This can be achieved through the addition of membrane from vesicles delivered to sites of invadopodia formation. 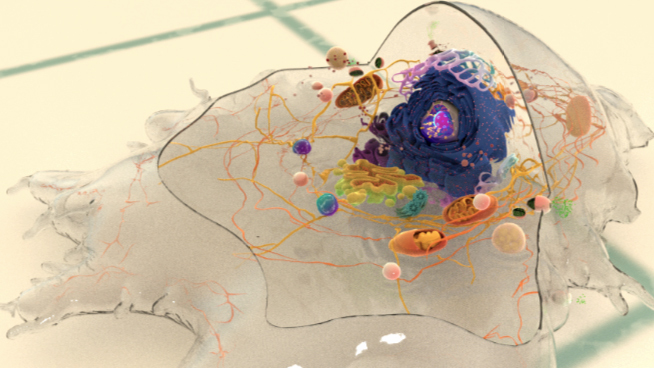 The Golgi apparatus is found in close proximity to invadopodia and is speculated to be positioned in such a manner to meet the demands of new membrane incorporation . New membrane must be remodeled to allow for the growth of invadopodia into the extracellular matrix (ECM). F-BAR proteins have long been known to modulate membrane curvature and recently the F-BAR protein, CIP4 (Cdc42 interacting protein 4), has been implicated in invadopodia as both a scaffold and a means to promote membrane curvature . The combination of actin polymerization and membrane incorporation ultimately results in the extension of invadopodia into the extracellular matrix (ECM).